Did Stephen Hawking Crack the Information Paradox to Black Holes? On Tuesday, renowned physicist Stephen Hawking presented his new theories on black holes to a gathering of esteemed scientists and members of the media at KTH Royal Institute of Technology in Stockholm. Hawking focused on something called the information paradox, an aspect of black holes that has been puzzling scientists for years. Basically, the paradox involves the fact that information about the star that formed a black hole seems to be lost inside it, presumably disappearing when the black hole inevitably disappears. However, according to how the universe works and what physicists believe, these things cannot be lost. But where does the information go when the black hole that’s absorbed goes down the drain? Have you ever heard of a “fire rainbow”? Well, it’s neither fire nor is it a rainbow. The majority of exo-planets discovered are called “Super Jupiters.” They’re the most discovered because their great size contributes to the slight tug, or wobble, of the star they orbit–much like an Olympic athlete when competing in the hammer throw. And in this orbit, they’ll annually pass in front of their star, dimming the starlight output from our relative view, alerting us to its presence–like a bug flying in front of a lightbulb. 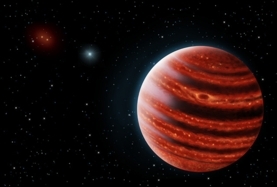 Unlike most “Super-Jupiters,” which have the characteristics of very cool stars, 51 Eridani b is much more like a gas giant planet. It orbits its star about 13 times the diameter of Earth’s orbit around the Sun. The 51 Eridani system lies about 100 light years away. We’ve been searching the stars and scanning the heavens for many years, trying to find another solar system that might be able to harbor life like our own. And through the years we’ve edged very close to finding similar planets to our home planet of Earth. Well, on July 23rd of this year, the Kepler Mission announced that it has discovered the closest thing to an Earth 2.0. It is Kepler 452b and it’s only 1,400 light-years away. Here’s the who, what, when, where and how of this new discovery.